Are you attached to the health and wellbeing industry ? Our digital solutions are designed to allow you to communicate your experience and qualifications to our viewers. The ethos of BIGA Care is to give more choice and control and make the management of a health condition simpler. Our role is to support people with a health condition, families and carers who are often overwhelmed and become confused in choosing the right health service to make that choice. An important part of our services is to work with health professionals and the individual to ensure they feel comfortable with the proposed treatment. To provide greater information about community health services available our creative team has added a health directory to help members of the public find the right service for them.This is also gives business who are attached to the health and wellbeing industry the opportunity to communicate to our viewers in how they can assist in managing health. 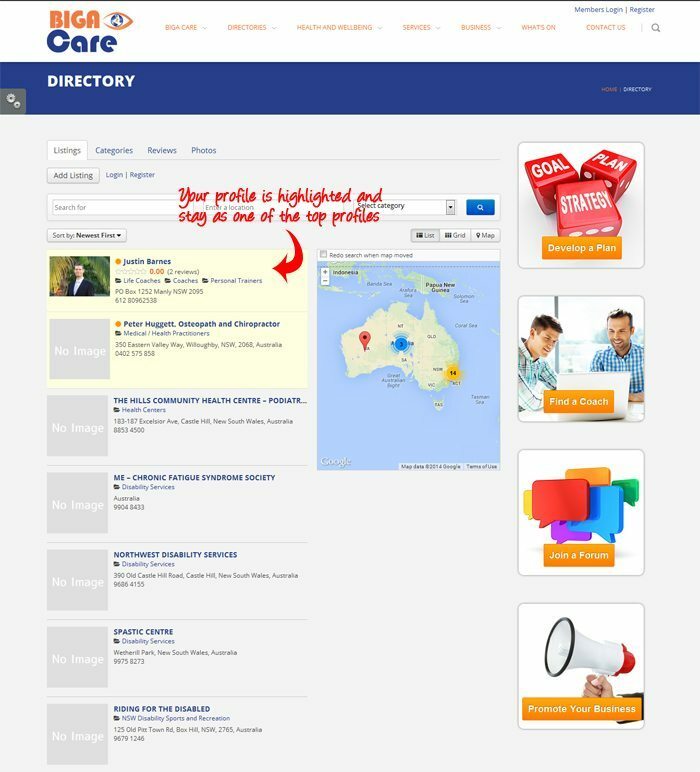 Promoted extensively online through the major search engines BIGA Care now offers businesses that are engaged in health related activities, independent health professionals, groups, associations and care services the opportunity to list their business on our directory and events on our event calendar. We offer an extensive range of standard digital solutions that allows you to build a profile add events to the what’s on calendar. Whether you are new to the world of online marketing or looking to refresh your options, our team’s main focus is to work closely with businesses, independent professionals, groups and associations to develop a marketing campaign that our viewers understand. Should you like to discuss an extensive marketing campaign please contact our creative team who offer tailored marketing solutions that have been tried and tested. Delivering health and wellbeing information to local communities we are well positioned to provided targeted media solutions for business, independent professionals, groups and associations . Be it on a laptop, desktop or on the go, people are spending more time online than ever before, our media allows advertise to easily segment their market by service, location, placement and reviews. We offer both free listings and paid advertising with the directory continually being updated to ensure it is current and relevant, priority positioning within each category is on a first come first serve basis. Should you wish to be listed higher in one or multiple categories you can benefit from our featured listings. No matter what area of health and wellbeing you work in, more customers mean more business — and the biggest boost to a business comes from those that need your service or product. Our basic listings gives you advanced placement in the directory, and our professional ability to engage people on the forum giving you great exposure to those looking for your service or products. 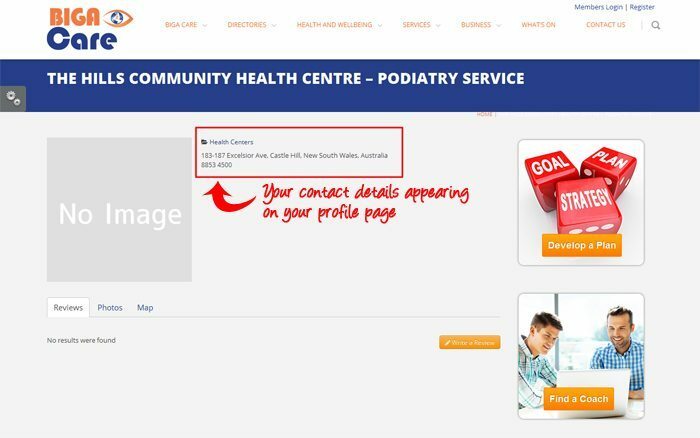 When the member is look for your service or our coach has someone who can use your service, they simply click on your profile or send you a referral provide the contact information of the person they’re referring. It’s now up to you to contact the client, and close the sale! In addition to a profile you will be able to engage people through topic articles share your advice and introduce yourself to those people you think you can help on our forum. Thousands of people live with a condition and find it hard to find services and products. 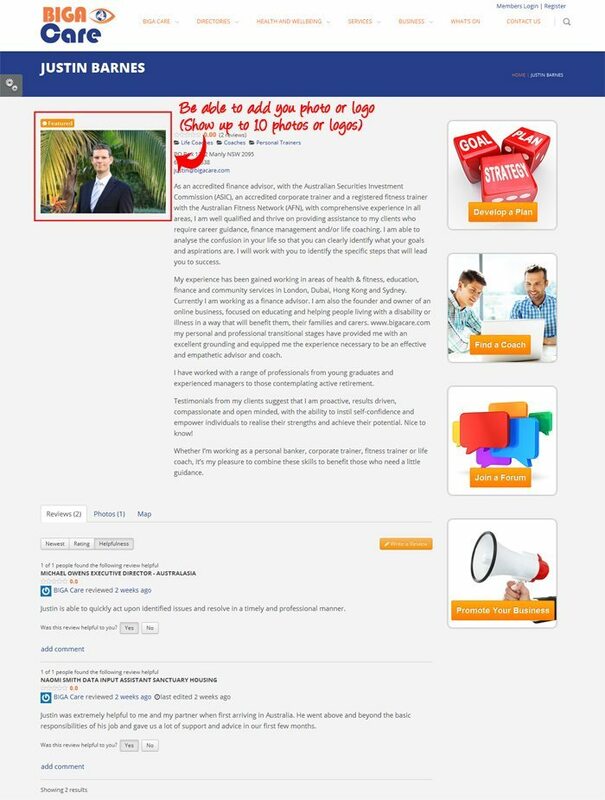 Individuals simply visit your profile page and can go to your website or connect with you via the forum where you can talk to them directly. 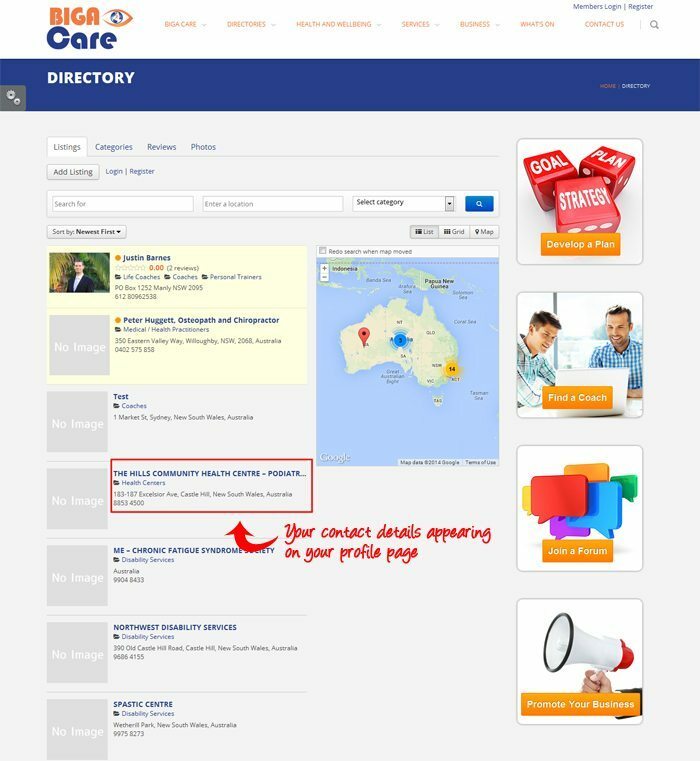 Get your business noticed with BIGA Care Digital. With so many options, there’s something to suit everyone. 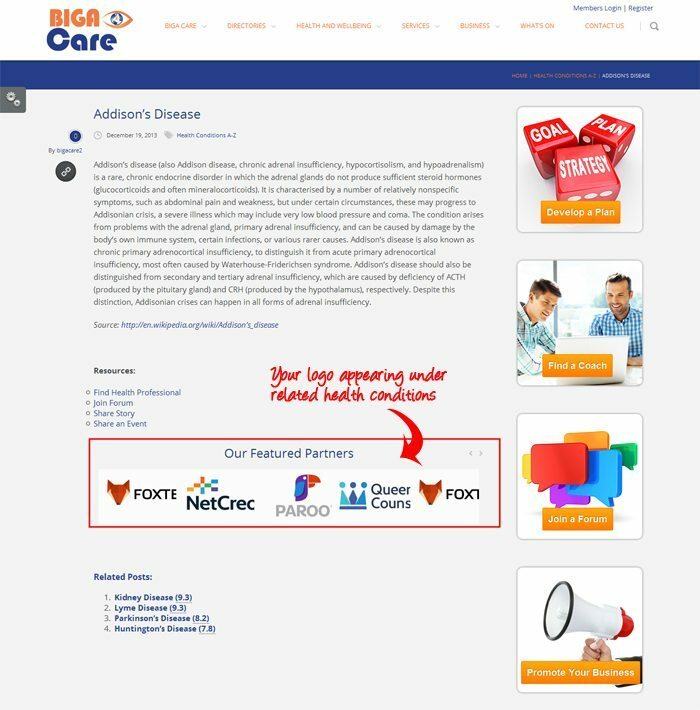 Wether you’re just starting out or looking to reach a greater audience, BIGA Care has an online advertising option for you, Compare our product range below. All paid advertising also receives exposure on our social media sites. Text will be formatted similarly to the rest of be inspired website. No colours, font changes or full caps. We recommend you have a simple text listing, then link to your website or training brochure/flyer. Remember that PDF’s are not accessible to everyone and we encourage you to use an alternative like Word or RTF. •Attachments should be attached to the email as a separate document. Advertisements are listed for a maximum of 1 month before rotation. Be inspired get active reserves the right to accept only advertisements of direct interest to members. The directory is continually updated ensuring it is current and relevant, priority positioning within each section is on a first come first serve basis.